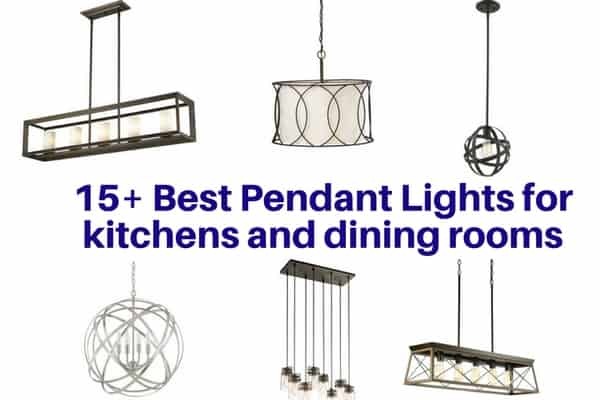 One of the easiest ways to add a new flair or finishing touch your kitchen or dining room decor is to add pendant lights. They are a real signature piece that can define a room and light it up at the same time. 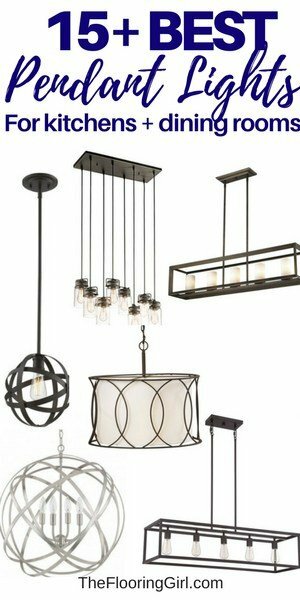 Pendant lights can be used strategically in key areas that need some additional light such as kitchen tables, dining room tables, kitchen islands and even entryways. They are so versatile and come in a variety of sizes, shapes and styles from rustic farmhouse decor to super modern. One of the things I love most about pendant lighting is that even when the lights are off, they make a gorgeous accessory that makes a statement. The possibilities for pendant lights are endless. So, I’m sharing a few of my top picks. If you click on any of the images below, you can find more info on size, prices…or even buy them online. Please note that this article contains affiliate links. That means that if you buy something, without any additional cost to you, I may earn a small commission. You can read my full disclosure at the bottom of the page. Should you install cabinets or flooring first? The main issue I have with pendant lights is changing the danged lightbulbs. Our kitchen pendants use these tiny bulbs, and you can’t let your skin touch them. Elizabeth – LOL, that’s crazy. I guess it depends on the bulbs used. And, I suppose you can just use paper towels.